Caffeine is a naturally occurring substance in your morning java, unless you drink a decaffeinated version. According to MedlinePlus, the average 8-ounce cup of coffee has 100 milligrams of caffeine. While knowing this can help you stay under the recommended daily limit of 300 milligrams, it isn't quite as clear-cut as simply consuming 3 cups of coffee a day. The exact caffeine content of coffee varies depending on roast, bean type and even brand. When you peruse coffee labels, you will likely see a roast type: light, medium or dark. This is an indicator of flavor strength, with the dark roasts having the boldest tastes. The darker the beans, the longer they have been roasted. While a stronger dark roast might seemingly have a higher caffeine content, this is not true based on the roasting process. The longer coffee beans are roasted, the more caffeine is burned off. Light roasts aren't as strong, but they pack the most caffeine. Coffeehouses often pride themselves on the types of beans they roast. This can dictate flavor, as well as caffeine content. Most brands use either Arabica or robusto coffee beans, the latter of which has the most caffeine. In fact, NPR News reports that Arabica beans contain half the caffeine of their robusto counterparts. Once the beans are roasted, long brewing times can also lead to more caffeine. A traditional drip maker with a filter tends to bear the most caffeine because of its long brewing time of five minutes. A French press, also called a "plunger pot," brews two to four minutes, so you may end up with slightly less caffeine. A shot of espresso has the least caffeine because the coffee is in water for only 20 to 30 seconds. But because of the small serving size, it's more concentrated. Aside from the basics of roasted coffee beans, the caffeine content in your cup of joe can even vary by brand. Because brands don't indicate the exact caffeine content on their product labels, one way you can tell is by how much you pay. According to the "Daily Mail," the priciest brands of coffee usually contain the most caffeine. Another misconception is that espressos and lattes have more caffeine than plain, black coffee. They actually have less because such specialty drinks are made with dark roasts, as well as less brewing time. Before you choose a latte over regular coffee, keep in mind that even though it might not have as much coffee -- thus not as much caffeine -- added creams and sugars can lead to more calories and fat. Consuming too much caffeine can be a real concern, as it can cause unwanted side effects such as irritation, restlessness and increased urination. MedlinePlus considers 10 cups of coffee a day excessive but recommends no more than three a day to prevent side effects. Also be aware of other forms of caffeine you may consume on a given day, and plan accordingly. Caffeine is primarily plant-based, but it is sometimes manufactured and added to products and foods. Before getting another cup of coffee on a given day, consider other sources of the substance you plan on having, such as soda, tea, chocolate and aspirin. 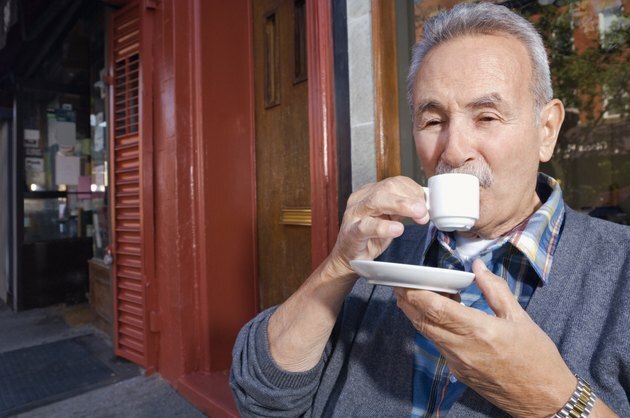 Caffeine can also affect you more as you age. Daily Mail: How Much Caffeine Is Really in Your Morning Coffee?